Know thyself. Most often this saying is used to express the value of understanding the nature of your own mind. Realizing what it is you are truly like, puts you in a state of awareness to change the patterns of behavior you currently possess. Less often do we hear “Know thy body,” however, tuning into the way our body moves, knowing where it is strong, where it is coordinated, and when and how it fatigues, is also of great value. The reality is, without recognizing underperformance in your body, the risk of future injury or exacerbating an old injury increase dramatically. The fact that there is an underlying issue to begin with, will put you in a vulnerable place as your body attempts to compensate and navigate normal activities. Remove the awareness factor, and you are going to attempt an athletic move that you would have performed differently had you took the time to check in with your body. After an athlete takes an injury, let’s say an ankle sprain, her body begins to limp without really thinking about it. Her body changes the way she moves and ambulates in space to keep force from getting to the area of injured tissue, to protect her. The issue is the body has learned this new way to move and navigate, and even long after the ankle has healed it maintains, however slight, the pattern of muscle firing which protected it when the ankle was hurt. This pattern is not normal and will promote a vulnerability to take injury elsewhere in the future. This is why we always see the same 3-4 kids hurt on the team, moving from one injury to another. As you go to perform in the future you are doing so with what we call a compensation pattern. Your body figured out a way to keep you moving without pain or discomfort or instability in the area of involvement, however, in doing so, it is working harder than it should elsewhere, which primes us to reinjury in these new overworked areas. 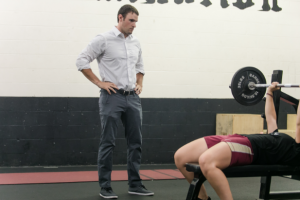 Recognizing the imbalances, underperforming, or dysfunctional parts of yourself is the biggest step you can take to promoting future athletic health. The reality is your neuromuscular system is constantly monitoring and changing length-tension relationships of your muscles. They are tight in some areas and loose in others for a reason. This is why soft tissue modalities that locally address a ‘tight” muscle do not work for long-term change. We have to address why there is muscle guarding and restore integrity to the areas of your neuromuscular system that are not doing their job. Remember, this is not an issue of strengthening muscles at all. The answer is not to do 1000 leg extensions to repair underperforming quadricep muscle. You have to change the way your brain is engaging your muscles to turn them on with speed and integrity. One of the best ways to do this is to use what we call neurolymphatic points. Used in conjunction with manipulative therapy and other neurostimulating interventions, you can prime your body to permit appropriate muscle firing sequencing and patterns, allowing better force absorption for your activities. What does this mean for you? In the short run, it means less pain. With proper speed and sequence of muscle contraction the body absorbs force appropriately, and the areas that cause pain due to poor force absorption are finally permitted to heal. In the long run, this means you are much less likely to go out and take an injury, because your body is working the way it is supposed to.